The OSRBG was part of the three show event with AICA and SACATS, taking place at the Penzance Primary School, Durban on 2 July 2016. The three Independent Clubs shared the venue, once again, with SOPA, under the auspices of the KZNCC, a CFSA club. A lovely new venue and an enjoyable day, as always when cat friends get together. Exhibitors were from various provinces. 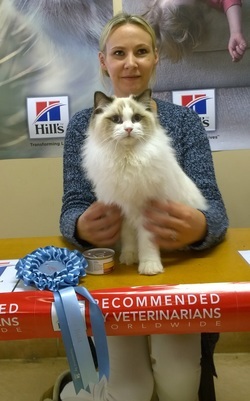 The show was judged by Ngaio Crawley, SACC Allbreeds Judge and the Overall Best on Show by all the Allbreeds judges present. The prizes were sponsored by Hills.